Hi Friends! Welcome back to the blog! I am so excited about today’s recipe because it’s a pasta dish and pasta is delicious! I have been a fan of Modern Table Pasta for years and I’m so excited to partner with them on today’s post. 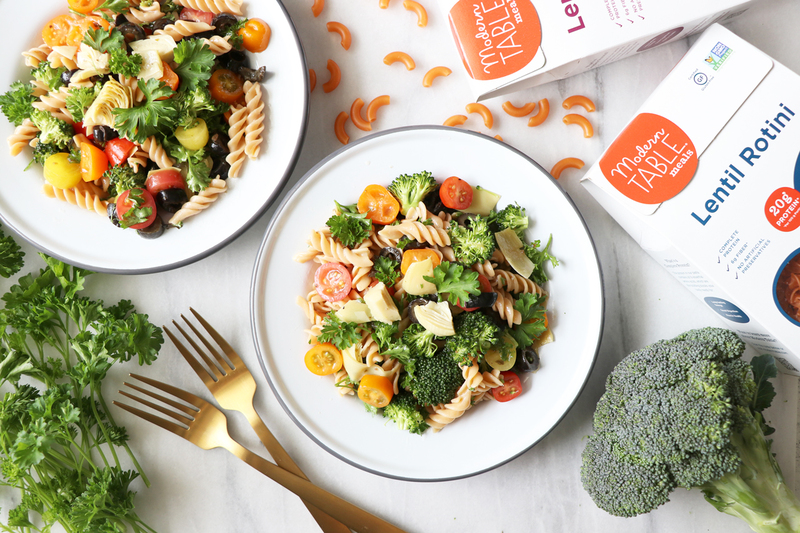 Their bean based pastas are packed with protein, fiber and wholesome ingredients which completely elevate their pasta compared to traditional pasta – in my opinion! I love simple recipes that can be made ahead of time & hold up well in the refrigerator for a few days! It makes lunch-time, snack-time or dinner-time a breeze! Today I’m sharing how to make my Easy Italian Salad Pasta which I love to eat as a cold pasta salad on a hot summer day. We also love this pasta salad when we go camping or to the beach for a fun day trip because it travels well. It’s also the perfect pasta to bring to a summer party! In a bowl add pasta and all additional ingredients. Toss together with salad dressing. Keep stored in the refrigerator and enjoy within 3 days. 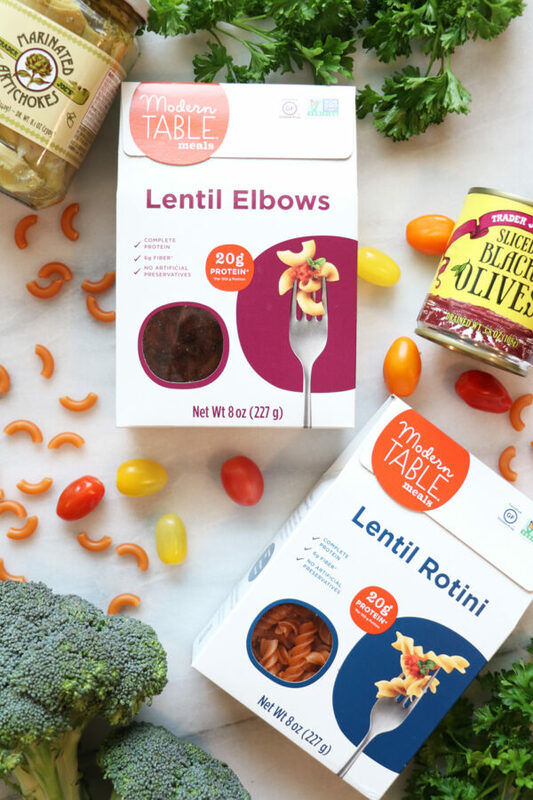 Modern Table Pastas are made with lentils and other good for you ingredients such as rice to provide the body with a complete source of protein. This means your body will have all the essential amino acids it needs to build, repair and restore muscle – right from your pasta! They are protein rich bean based pastas! Enjoy 20 grams of protein 6 grams of fiber per portion! These nutritional benefits cannot be found from traditional pasta! Plus the taste & texture is really, really good! To learn more about Modern Table make sure to visit their website here! Disclosure: This post is sponsored by Modern Table. We only partner with brands we genuinely use, love and are excited to share about with the Healthy Grocery Girl Community!